Washington, Feb. 12 – President Truman said today that the Government of the United States was supporting the United Nations’ settlement of the Palestine issue. The President declined to elaborate his assertion when questioned at his press conference, declaring it was as far as he could go. Mr. Truman gave a slightly fuller exposition of his stand in a reply to a letter from Representative Frank Buchanan, Pennsylvania Democrat, which called attention to the conflict in the Holy Land and the deterioration of the partition situation and asked for the President’s views. The reply, made public today by Mr. Buchanan, stated: “Palestine has been a matter of considerable disturbance to me ever since the Japanese surrender and I've been endeavoring to get the matter worked out. 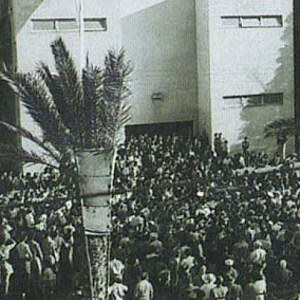 It's now in the hands of the United Nations and this Government is backing the United Nations in the settlement they have suggested.” The President’s disinclination to discuss the problem presented by opposition to the United Nations proposal to partition Palestine was interpreted as an indication that the whole question was currently being studied at the uppermost policy levels. Palestine has been a matter of considerable disturbance to me ever since the Japanese surrender and I've been endeavoring to get the matter worked out. It's now in the hands of the United Nations and this Government is backing the United Nations in the settlement they have suggested. It wouldn't be until 6:11 p.m. EST, on May 14, 1948, though, that the United States’ support for the first Jewish state in nearly two thousand years was a sure thing; and even then, it did not include lifting the arms embargo, loaning, or all that summer and fall, dropping its advocacy of a policy of mediation and compromise in the United Nations. Typed Letter Signed, as President, 1 page, quarto, The White House, Washington, February 9, 1948. To Congressman Frank Buchanan. With transmittal envelope. I appreciated your letter of the fourth in regard to Palestine.